How do I create a custom sized album? Pixellu SmartAlbums 2 includes album presets for over 80 labs from around the world, and we are constantly adding more. If your print lab is not on our list of presets, please email us and we'll be happy to contact them in order to get the integration process started. 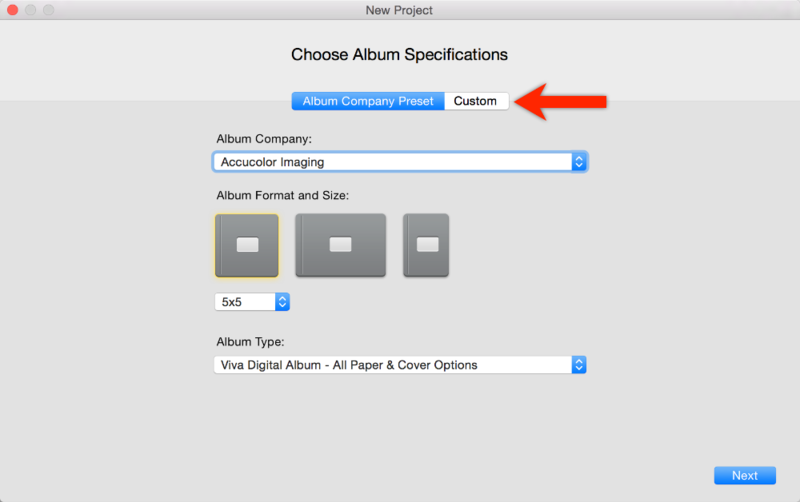 In the meantime, you can create a custom sized album if you know the specifications the album you are looking to design. To do so, click on the "Custom" tab when creating a new project. 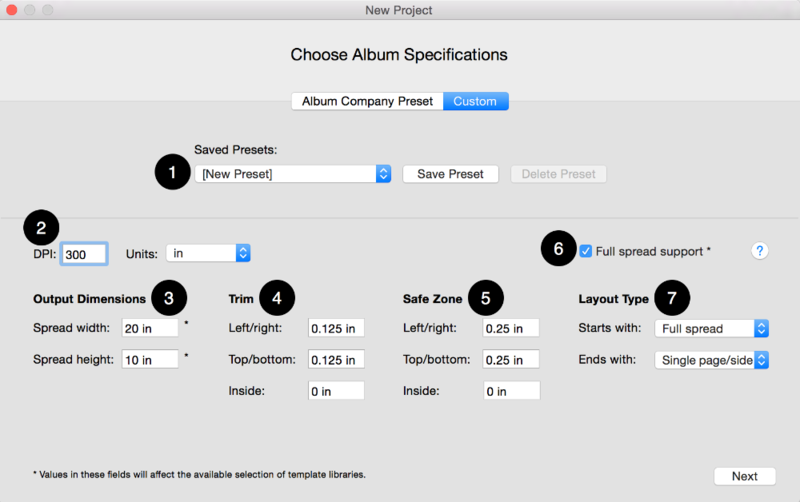 Use Save Preset when you create a custom album that you intend to reuse in the future. Once saved, it'll appear in the Saved Presets dropdown. DPI (dots per inch) is the album resolution. In most cases it's 300, though sometimes it can be 240 and 200. Enter the full spread dimensions, not the single page dimensions. If your album is called "10x10", you should enter "20" for the width of the spread. Note: make sure to contact your print lab to ensure that you are using the correct dimensions for your spreads. Trim is how much will be cut off the printed spreads/pages before being placed into the album. To learn more about trim, including inside bleed fill, read the Inside trim & bleed fill article. Safe zone guides are just precautionary and do not have an effect on the export. They simply help to make sure that important elements are not closer to the edge than the print lab suggests. If the Full spread support box is unchecked, layouts with image frames crossing the middle of the album will be disabled. If checked, then no such restriction will be applied. "The album begins on the left" means it starts with a "Full spread". "The album begins on the right" means it starts with a "Single page/side". "The album ends on the left" means it ends with a "Single page/side". "The album ends on the right" means it ends with a "Full spread".